The little bud containing life characterizes the mission of our MIC Sisters in Cuba. Seven very active Sisters reach out to the youth, the families and also work in parishes. They sow words of encouragement, and proclaim Jesus Christ. Notwithstanding the few positive steps, the social context generates frustration and provokes emigration especially among the youth. Our country is going through a historical moment in terms of its demographic situation. In the last few years, the population has shown a decrease in numbers and an escalation of the aging factor. The decrease in numbers is perceptible; it is the result of a lower birth rate and of increased migration. Since there is no link between the country’s social plan and the people’s personal plans, frustration is the outcome. The State must offer seniors dignified institutions as well as proper programs that will contribute to their well-being, peace and joy in the latter part of their lives. Health, education, and sports which had important results in past decades are now at a standstill, if not in a process of decline. However, people gladly welcome a few changes, such as the return of high schools and pre-university institutions in the cities, the authorization to sell or buy property and vehicles, the possibility to create a small private or family enterprise, and free access to hotels for Cubans. Regardless of these changes, one can perceive among many citizens an urgent expectation of deeper and more needed reforms that will enable them to solve pressing problems that generate anguish and uncertainty. There is a clear demand for daily public transportation, clothing, food and other longer term needs such as lodging and social security pensions. Several groups of people wish they could count on greater social autonomy that would enable them to develop projects convivial with civilized accepted norms and responsive to specific needs that unite and energize various human groups in their search for the common good, without having to wait for an answer and solutions from the government. We, the Cuban people, have the ability to store up great reserves of joy, creativity and talent. We are spontaneous and extraverted people, capable of struggling for life; we are patient, friendly and courageous. We strongly believe in the importance of work, which is indispensable for the country to move forward, but at the same time, we show a lack of honesty and responsibility at work. There is a major crisis of human and evangelical values. Our people express their religiosity in multiple and varied ways. Many of these expressions externalize popular beliefs based on the Catholic faith while others originate in African-based traditions. Such diversity shows that the Cuban people are really alive, that they thirst for God and are in search for meaning in their life. The post-modern mentality is increasingly obvious. Globalization is invading us every day, step by step. In the last few years, the use of cellular phones and “memory” gadgets is more and more widespread. However, access to the internet continues to be very limited. We long to be better informed and better connected. On December 17, 2014, the governments of Cuba and the United States took a historic step by declaring their decision to work together to re-establish diplomatic relations between the two countries, relations that have been severed for more than fifty years. This announcement was greeted by the people with great enthusiasm but also with a bit of distrust. Clearly, such a decision should bring about, in the political arena of both countries, certain changes favorable to the people. In recent past, we lived various events that were most meaningful: the three missionary years in preparation for the Jubilee Year; the journey of the image of Our Lady of Charity around the Island and the Marian Jubilee Year recalling the 400th anniversary of the discovery of the image of Our Lady of Charity; the visit of Pope Benedict XVI and the Year of Faith. All these events contributed in reviving our missionary spirit and enabled us to live in communion with the Continental mission as proposed by the Aparecida Episcopal Conference. Though 60% of the Cubans are baptized Catholics, approximately 2% of the population participates at the Sunday Eucharist. However, they live by the Christian values that give a face to our culture. In most parishes, efforts are exerted to make the Mission a high priority. Some have succeeded in permeating the life of their communities with the missionary spirit. One of the Spirit’s greatest gifts is the existence of the catechumenate where the future of Church is taking shape. It’s a major challenge and a beautiful one because most of those who are part of these communities are adults and young people who have asked to be initiated into the faith. The social and charitable dimensions of faith are expressed in our communities through multiple initiatives of service and through the Caritas teams—volunteers of the Health Care Ministry and the Ministry of reconciliation. 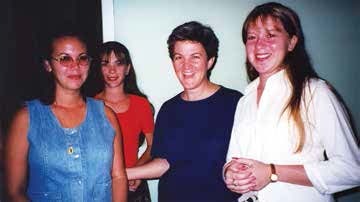 As Missionary Sisters of the Immaculate Conception we want to live with the increasing awareness that our mission is to follow Jesus with joy as credible witnesses to fraternal living and we wish to be more involved with the marginalized people who live by the wayside and whose rights are not being heard. We participate in parish liturgical animation, in sacramental preparation, and in the formation of future lay leaders. Furthermore, we work with youth groups at the parish level; we attend their meetings and welcome them in our fraternities. Our other commitments are within the catechumenate level, the missionary childhood movement and we provide special attention to handicapped children and their families. We also contribute to the magazine of the Catholic Women’s Movement. We coordinate the activities that take place at the Spiritual Renewal Center in Colon while also animating retreats with a Jesuit team and giving workshops with ES.PE.RE. (Schools of Forgiveness and Reconciliation). Throughout very difficult contexts, we have walked the long walk with our Cuban brothers and sisters but we are encouraged by their openness, positive attitude, and enthusiasm in collaborating with the Church in its diverse projects. Though our MIC group is limited we are aware that God works through our frailty, weakness and littleness and all He wants is our unconditional love and offering. This tiny little bud will bloom and within it will be the seeds of life. 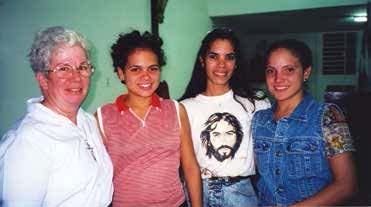 We are convinced, as MIC Sisters in Cuba, that our missionary spirituality of Thanksgiving holds a bright future on the Cuban soil.